It was, as I recall, a late-Monday-morning menu brainstorming session taking place in the Deli section of a large wholesale grocery store. We were pondering the approaching evening meal for about one hundred of our closest friends and the need for a third dinner option to fit nicely somewhere between Parmesan Chicken and three different pastas with a variation of sauces. At a point just after locating the Feta cheese and cherry tomatoes for the salad bar we landed on how to compliment those other fine offerings. 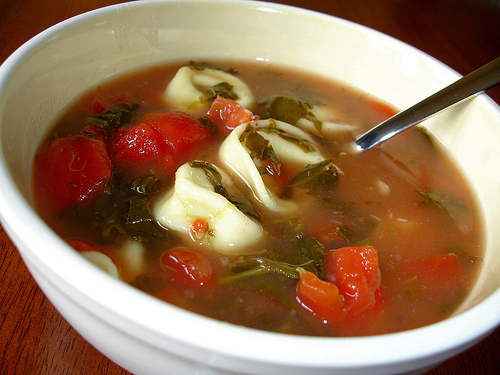 Tortellini Soup. Brilliant, simply brilliant. Sauté the bacon and sausage in the oil, add the onion, garlic, carrots and celery for just a couple minutes. Stir in the spices. Add the tomatoes and the chicken broth. Bring to a boil, and then reduce heat to a slow simmer for about 30 minutes. Add the kidney beans and the tortellini. Cook for another 30 minutes until the tortellini is tender.